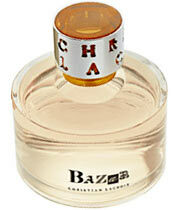 There are 3 reviews of Bazar Femme. A well done fruity floral. The peachy note isn't too obnoxious. The base is rather pale. Overall it's breezy and delightful. The bottle and packaging are fun. A really nice balance of citrus and apricot at the opening - dries to a slightly dusty, green iris. Girly girl without being excessively sweet or fruity - a lovely hot weather companion! i bought this last summer in cannes, france. i find this scent feminine, light but definitely there, and pretty seasonless...i feel comfortable wearing it year-round. my favorite scent is pure tiffany by tiffany--if i rank PT a 10, this is an 8. i like that it is unique. There are no member images of Bazar Femme yet. Why not be the first?